FOXBOROUGH — Super Bowl Sunday ended in bitter disappointment for the New England Patriots and Rob Gronkowski. For the star tight end, coming home probably didn’t help matters. Gronkowski’s Foxborough home was broken into while he was away at the Super Bowl, a theft that might have involved “multiple safes and possible guns,” according to a police dispatch. Gronkowski called police at 6:18 Monday evening to report that “his house was broken into and had multiple items stolen,” according to a police log entry. Gronkowski returned home Monday, the day after the Patriots’ narrow loss to the Philadelphia Eagles in Minneapolis. The house was empty at the time of the burglary, police said. Foxborough police Chief William D. Baker declined to say when the break-in occurred, or what was stolen, to protect Gronkowski’s privacy and the integrity of the investigation. Baker would not say whether Gronkowski’s home has a security system or surveillance cameras. 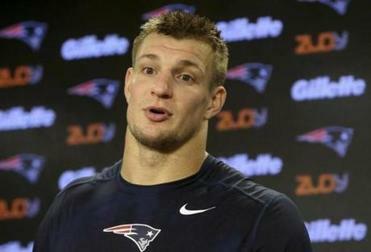 There have been no recent break-ins in the quiet cul-de-sac where Gronkowski lives, police said. Gronkowski’s room was locked and secured at his Congdon Circle home, according to a heavily redacted police report. But items were taken from the rooms of his two housemates, Robert Goon, 37, and Nathan Ruckdaschel, 29. Ruckdaschel told police that the stolen items were worth several hundred dollars. Goon also reported that items were stolen from his room. The police report, which suggests the burglar or burglars accessed the house through a broken window, redacted the list of stolen items. Police conducted a forensic examination of Gronkowski’s property during their investigation, officials said. Gronkowski left for Minnesota on Jan. 29, the report stated. Goon and Ruckdaschel followed on Feb. 1, and they told police that home’s doors and windows were secured when they left. Gronkowski’s home is enclosed by a fence and is part of a subdivision of spacious, custom, single-family homes known as Highlawn Farm. The subdivision is located off North Street, not far from Gillette Stadium. Baker said timing of the break-in, coming on the heels of a heartbreaking loss, was especially unfortunate. Neither Gronkowski nor his agent, Drew Rosenhaus, could be reached for comment. The 4,486-square-foot home was built in 2014 and is currently assessed at $997,000, according to town records. Gronkowski owns an adjoining property with a ranch-style home and an attached garage assessed at $699,300. Foxborough residents were dismayed by the break-in. Linda Kontoulis, who owns a pizza parlor on Main Street that counts Malcolm Butler as a regular customer, said she was shocked when she heard the news. “That’s a shame. My heart is broken,” she said. She wondered aloud who would do such a thing. “We love our boys here,” she said. Emily Sweeney can be reached at esweeney@globe.com. Follow her on Twitter @emilysweeney.John R. Ellement can be reached at ellement@globe.com. Follow him on Twitter @JREbosglobe.Danny McDonald can be reached at daniel.mcdonald@globe.com. Follow him on Twitter @Danny__McDonald.